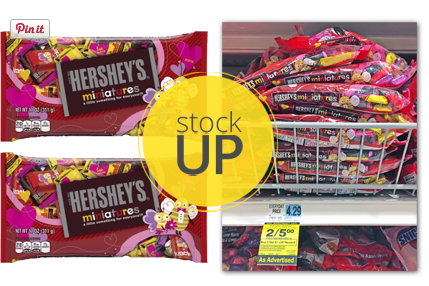 Stock up on Hershey’s Miniatures Valentine candy bags at Rite Aid! Buy two Hershey’s Miniatures Valentine candy bags. Use one $1.00 Smart Source coupon. Use one $2.00 Rite Aid coupon. Pay $2.00 and receive a $1.00 +Up Reward. Total $2.00 plus receive (1) $1.00 Up Reward, making them only 50¢ each after coupons and UPR!